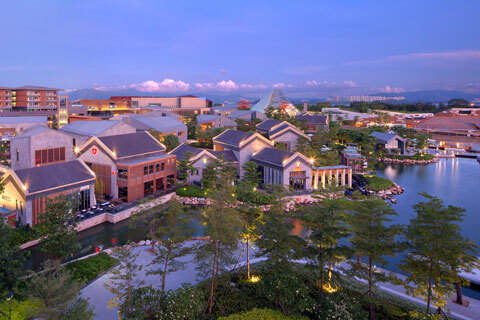 The O’Plaza Shopping Center stretches across the north edge of the site to provide a unique and memorable multi-level indoor luxury shopping experience with expansive views of the lake. The 155-room Marriott Executive Apartments rise five levels above the shopping center to complete the structure. By employing gently curving forms, innovative lighting, and a modern mix of materials, the architecture of the interior guides visitors through the complex. The interior of the O’Plaza Shopping Center is a contemporary interpretation of the traditional retail arcades of Europe. Throughout the mall, expansive skylights bring natural light to all levels of the building.